I have Atomic, Static Electricity and Nuclear Energy and have *never* seen Sea Siren, although it looks like it definitely trumps Atomic from your photo's. ... oh yeah, I might be a tad jealous of your DS polish. ;) Looking forward to your post on it! Can't wait to see your DS post, I never get sick of seeing that one. I hate the art deco stripers too! The brush is just too short and fat! I love all the jellies! The teal is especially marvelous! Nice, I'm really starting to like jellies! I found Sea Siren a couple of weeks back at Dollar Tree. 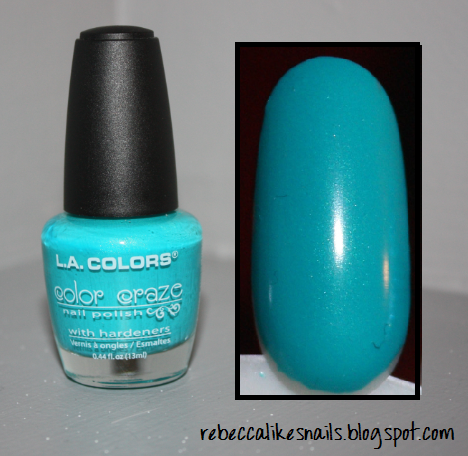 I noticed that some of them have been restocking LA Colors nail polish and some new ones, like Sea Siren have been showing up. So check there for a backup and maybe some other colors to try. I'm crap at nail art, but bought those stripers anyway. I hear they are great to franken with, especially the glitters since they are already suspended, you don't have to worry that your glitter will all sink to the bottom of the bottle.